When it comes to DIY home improvement, usually the staircase gets overlooked. Yet if you take a second look at your stairs, you'll see that they can really make a difference in the appearance of your home. 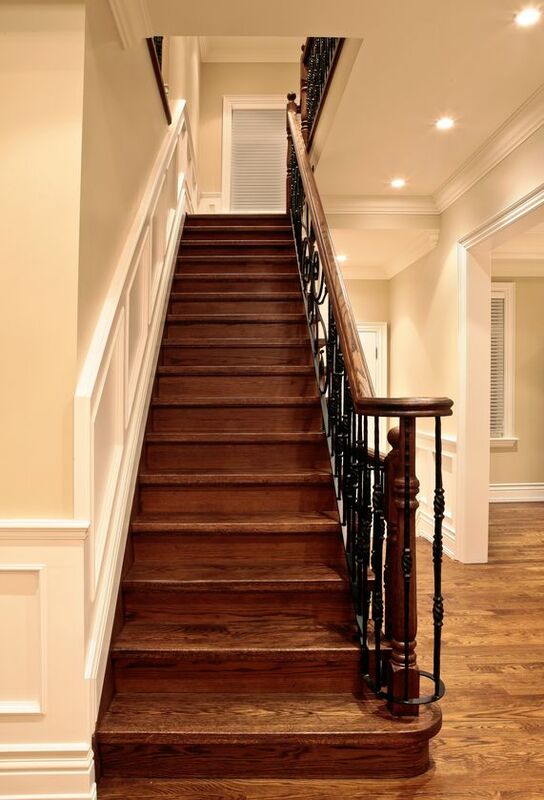 What are some ways you can spruce up those old stairs and bring up the appeal to potential buyers? These DIY staircase projects can get you started. You can't beat the look and classic feel of black and white. And there's no material more dignified than tile. You don't need to get a loan to cover each riser in custom tile. You can get some paint and a stencil for the same effect. If you have a longer staircase, consider stenciling every other riser. You want to delight climbers, not make them dizzy. A personalized staircase doesn't need to take over the interior design of the house. You can use chalk paint to give your stairs a soft, subtle look. The pretty pattern is unique enough to feel custom, but the light colors and chalky finish prevent it from overpowering the room. You can also use tile to give your stairs a great look and offer more durability. Creating alternating sets of pattern and complementary colors on each riser makes for a one-of-a-kind staircase that’s anything but redundant. While trimming tile to fit stair risers might be above some DIYers’ pay grade, this personalized look could be worth flagging down an expert to pull off. Have a specific obsession? Decals are a great way for your staircase to share your fandom. Peel-and-stick decals can be customized with your choice of words or images. Bibliophiles can choose book titles like these, but thanks to the wide world of available decals, you can also find favorite sayings, patterns, characters. Just make sure not to do this if you plan on selling your home soon. This is for those of you who want to customize a home you plan to stay in for a while or just bought. D ouble-check you’ve picked a rug that’s narrower than your stairs. Rugs come in such a blinding variety of dimensions, it’s easy to pick the wrong one. Are you looking for creative ways to make your furry friends more comfortable, as well as make your home more appealing? This can be a bit of a challenge, but with these clever DIY projects, you can do it. Plus you don;t have to spend a ton of money to make them. Check out these fun DIY projects. 1. If you enjoy having your dogs eat in the kitchen with the family, then this custom eating station is an ideal kitchen feature. You can find instructions to make your own. 2. Dog crates can take up space, especially with large dogs. Here's a great way to make cabinet space for you, and a space for your dog crates. Click here to see how to make your own. 3. Here's a great way to make a safe and relaxing place for Fido. This "dog cave" is the perfect hideout for your dogs to plan their next adventure. You can make one like this by Titus Built. 4. Tired of dog bowls being kicked around or moved, or just getting in the way? You can make a csutom eating station to keep their bowls together and off the floor, as well as store food. You can build one like this one found on HGTV.com. 5. If you love to re-purpose old furniture, this project is perfect. You can convert an old dresser into this creative eating station, designed for those who have both cats and dogs. The dogs can get to their food, but they can't reach the cat food at the top. The DIY project to make one is here. Source: Crafty Wife! Crafty Life! 6. Taking your dog to get cleaned can be such a chore. Why not build your own dog washing station? When you're done, you can just throw the towels in the wash. Here's a DIY by A Concord Carpenter on how you can build your own dog washing station. 7. Ditch that ugly dog food bag and make a nice drawer container. Follow these steps to make your own pull out drawer storage bin. Join us every week for more real estate tips and great reasons to buy your next home in Lake Travis. You can search for the perfect home on our website using our powerful home search tools. You can also get free listing alerts of homes as they hit the market at WelcomeToLakeTravis.com. And you can always feel free to call us at 512-657-4467​ to talk to an experienced agent today.